Daniel Callahan, a prominent bioethicist, says heaping more stigma on overweight people may help curb obesity rates in the U.S. Others say there's plenty of stigma already out there. Unhappy with the slow pace of public health efforts to curb America’s stubborn obesity epidemic, a prominent bioethicist is proposing a new push for what he says is an “edgier strategy” to promote weight loss: ginning up social stigma. Callahan outlined a strategy that applauds efforts to boost education, promote public health awareness of obesity and curb marketing of unhealthy foods to children. But, he added, those plans could do with a dose of shame if there’s any hope of repairing a nation where more than a third of adults and 17 percent of kids are obese. “Safe and slow incrementalism that strives never to stigmatize obesity has not and cannot do the necessary work,” wrote Callahan in a Hastings Center Report from the nonprofit bioethics think tank. Weight-acceptance advocates and doctors who treat obesity reacted swiftly to the plan proposed by Callahan, a trim 82-year-old. “For him to argue that we need more stigma, I don’t know what world he’s living in,” said Deb Burgard, a California psychologist specializing in eating disorders and a member of the advisory board for the National Association to Advance Fat Acceptance. “He must not have any contact with actual free-range fat people,” she added. That view is shared by Dr. Tom Inge, an expert in childhood obesity at the Cincinnati Children’s Hospital Medical Center. Still, Callahan, a former smoker, argued that public shunning of those who lit up led to plunging rates of cigarette use. People were asked to smoke outside and told directly or indirectly that their “nasty” habit was socially unacceptable. That same pressure could be applied to overweight people, perhaps leading to increased efforts by people to eat right, exercise -- and actually succeed in losing weight, Callahan argued. “The individual seems to be left out of this,” he told NBC News. But the difference between smoking and obesity is huge, said Burgard, the eating disorder expert. Stigmatizing obesity targets not just the act, but the entire person. “It’s a kind of identity you have that is actually the very most intimate thing about you: your very body,” she said. Callahan does worry that increased stigma will lead to more retaliation against overweight people in employment and other areas. He frets about finding a way to pressure people to do something about their extra pounds, but without making them feel too badly about it. “Can there be social pressure that does not lead to outright discrimination – a kind of stigmatization lite?” he wrote. Callahan’s theory has drawn criticism, not only from obesity specialists, but also from other bioethicists. 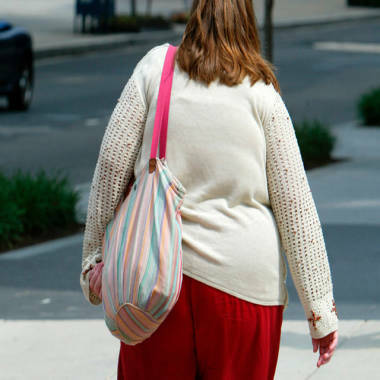 There’s already plenty of stigma heaped on the obese, said Art Caplan, the head of the Division of Medical Ethics at NYU Langone Medical Center, and an NBC News contributor. “Calls on each of us to take more charge of our food behavior in an environment in which the promotion of fast, unhealthy foods is omnipresent and celebrity chefs extol the wonders of high-caloric meals on television hour after hour is to spit personal virtue against a tsunami of marketing coming in the other direction,” Caplan said. Still, Inge, the medical expert, says Callahan’s call for more social pressure might play a role when it comes to prevention, particularly with parents of kids on the borderline of obesity. “If we could somehow make an impact with an edgier approach with young parents who for convenience sake, or out of ignorance, poverty or whatever make very bad dietary and lifestyle choices for their unwitting toddler, that might be something very worthwhile,” Inge said.